n terms of Christmas traditions, side effects 28 years is not very old. Given that historians trace many of our winter holiday customs back several thousand years to pre-Christian times, 28 years is actually just a blip. 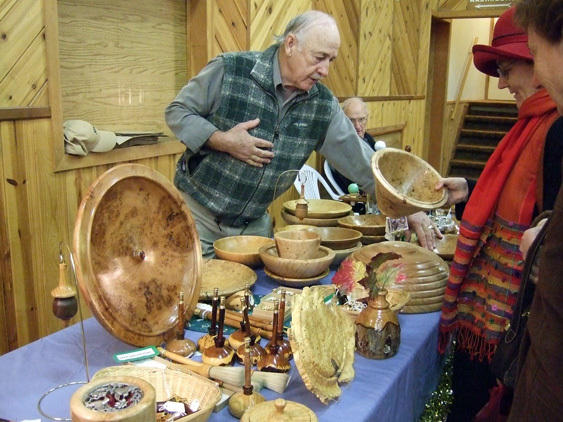 But 28 years has been ample time for the Denman Island Christmas Craft Faire to become, for many people, as essential to the season as carols, colored lights, presents and latkes. For these people, the Faire, reputed to be one of the best in BC, is not just a great place to buy gifts; it’s a treasured holiday-season tradition. The biggest draw, of course, is the variety and quality of the wares: pottery, weaving, jewellery, cosmetics, toys, carvings, culinary items, clothing and more. People come to shop, but also to enjoy. Gathered into the 8,300 square feet of two community halls is an array of artistic output that is the equivalent of several dozen gallery exhibits. There’s home-made food for sale in both halls and a variety of tempting snacks (poutine, steaming lattés made from locally roasted coffee, fresh-pressed apple juice) at the funky outdoor booths. There are twinkling lights and sprigs of holly and smiling faces, and there is beauty and color everywhere you look. “There are people who have been attending regularly for over two decades,” says Faire coordinator Leslie Dunsmore. In fact, she knows people who have been to every single Faire since it was launched— including herself. Dunsmore has been coordinator since the second Faire took place in 1981. It was clear that this event was going to grow and would need some focused management, so Gardner asked Dunsmore, an accomplished painter and community organizer, to take over as coordinator in the second year. Since then, the Faire, and her job, have both grown substantially. The task of putting on an event of this size—70-plus artisans, two community halls, more than 3,000 visitors—is huge, and not without challenges. Rumors that artisans have had fist-fights over prime spots for their booths are entirely unfounded, says Dunsmore. All she will say is that as the Faire grew more popular, competition for spots intensified and she realized she needed to set up some guidelines. Thus was born another local tradition: the Craft Faire application deadline. For years, Denman artisans have planned their lives in order to be available for this late-September date. Annually, they would crawl out of bed in the wee hours to line up at the Denman Craft Shop with their completed application forms. Those in the front of the line got first choice for their table location. When the Shop opened at 9:00 there would be as many as 50 people waiting. Over the years, Dunsmore developed strict protocols so no one can ‘work the system,’ for instance, by coming later and handing their application form to someone in the front of the line. This year the tradition has changed; Dunsmore has initiated a mailing system, which, she says, has worked well. “This year there were 40 applicants on the first day and only two spots were claimed by two people.” The conflict, she assures us, was solved peacefully. The Faire offers remaining spaces to artists from off-island. There is always more interest than space for these, says Dunsmore, so artisans must submit their work to a local jury, which has the difficult task of choosing who will exhibit at the Faire. The practical challenges of the event are many, and Dunsmore can remember overcoming all kinds of crises. There have been last-minute blown fuses, repeated brown-outs, and total power outages, but the Faire has always gone on. The year of the power outage, the hall was lit entirely by about 70 candles. “It was a beautiful shopping experience, but the fire chief didn’t know,” Dunsmore says with a chuckle. “That was a long time ago. These days we are much more careful,” she adds reassuringly. She laughs, as well, about the year two three-gallon buckets of honey leaked in the trunk of her car as she was about to set up for the Faire. “It was one of those moments—do I scream in total frustration, wail at the exhaustion of getting ready for the Faire, or keep pushing forward?” She chose the latter, and simply closed the car trunk on the three-inch deep pool of golden honey. Out of sight, out of mind—at least for a while. “Three days later, at home, on my third attempt at scooping up gobs of sticky honey, a friend arrived and said, ‘Oh, didn’t you know, cars nowadays have a plug at the bottom of the trunk so liquid can drain out easily…’ I was ecstatic to discover this simple engineering feature, failing to remember that honey running down the driveway in the middle of a beekeeping operation is not always a good thing. This being the West Coast, every now and then it snows, and when that happens, things can get crazy. In 2007, it started snowing early in the week of the Craft Faire and, in spite of the fervent prayers of many, didn’t really stop. On Thursday, Dunsmore started to get frantic phone calls. Some of the artists had no electricity for days before the event; others were stuck at home due to impassable driveways, or even stuck part-way down impassable driveways. This is when things get heart-warming. Volunteers showed up, often unbidden, wherever they were needed, with tractors, shovels and strong arms and backs; driveways were cleared, boxes carried, and nerves soothed. Dunsmore transported 40 strings of Christmas lights and 70 electrical cords down her steep and winding driveway on a make-shift ‘sled,’ which was just a sheet of plywood sliding precariously over the snow. The event carried on more or less as planned under a magical blanket of snow, with more white stuff falling from the sky all weekend. Attendance was lower than usual, but community spirit ran high. Community spirit, of course, is a big part of the Faire. The Faire brings the Island together to honor its artists, boost its economy, enhance community pride and celebrate the season. Dunsmore estimates the number of people involved in the event (vendors, assistants to vendors, decorators, shuttle-van drivers, food concession workers, buskers, cleaners, organizational support, and other helpers) as approximately 250; hundreds of other locals attend the event and host guests from off-island. Over the years, Dunsmore has seen many hobby crafters use the Faire as a stepping stone toward launching a business. Through their experience setting up and staffing a booth, talking to and observing their peers and interacting with clients, participants get a crash course in marketing over the weekend; they gain confidence, make business contacts, and often, come away inspired. The event brings in money not just for the vendors, but also for the community non-profit groups which run the food concessions and sell raffle tickets and other goods. All their profits go to worthy causes ranging from children’s orphanages in Nepal to local land conservation. As well, the children’s table brings kids out to take part in the ‘adult’ world, giving them a chance to experience the value of their efforts, practice business skills, and be recognized for their work. Oh—and have fun, too. After their shifts, many of the children gather up their earnings and cruise the Faire to get presents for their parents. “It’s not just about economic enhancement, it’s about bonding in the community,” says Dunsmore. The deep community roots of the event are part of what attracts so many visitors from outside of Denman Island as well. People are thrilled to experience such a vibrant alternative to mass consumption of mass produced goods. “In typical gift shopping, you go out to a big centre and look for the best bargain. You generally have no idea where it was made or by who. At the Craft Faire, everything you buy has the added value of relationship,” says Dunsmore. Artisans at the Faire are required to staff their own tables; for shoppers, being able to buy something directly from the person who made it is both fun and meaningful. As evidenced by the recent interest in local eating, more and more people these days are looking for authenticity, personal connection, and environmental sustainability in their lives—all of which the Craft Faire doles out a-plenty. “There’s a hand-made revolution going on right now,” says Denman artisan and Craft Faire exhibitor Bronwyn Simons, who along with her partner Bob runs Terra Home, producer of exquisite art tiles and hand-built tableware. “We’re paying more attention to where things come from and what they’re made of. Is it sustainable? Is it ethical? Does it have enduring value? Does it connect me with others in a positive way? Is it special and unique? A well and lovingly hand-made object usually answers ‘yes’ to all these questions,” says Simons. Dunsmore agrees. “Appreciation of the value of handcrafted objects has waxed and waned over the decades. Right now interest is high,” she says. Dunsmore says she has three favorite Craft Faire moments that recur each year. “The first great moment is at about 10-to-10 on the Saturday morning, when we are just about to open. I’m in the Community Hall. There’s a large surge of visitors at the doors; the guards are preventing them from getting in. Everything is looking pretty good; the crises are mostly over. I stand back and look around me and say to myself, ‘This is all quite beautiful.’ I know that mostly, my job is done. Now it’s up to the artists,” she says. Her second favorite moment comes soon after closing time later that day. The vendors have tidied up and gone home to rest; the night attendant (someone is needed to ensure the thousands of dollars worth of merchandise stays safe) doesn’t come till later. Dunsmore is alone, surrounded by an absolutely amazing collection of arts and crafts, like a kid in a candy store accidentally left behind after hours. “I make my way around the two empty halls, taking my time, and I memorize what I want. The next morning, once we’re open, I go around and buy it all,” she says. The third special moment is very simple: on Sunday afternoon, as the Faire moves into its final hour or two, Dunsmore makes the rounds of both halls handing out Japanese oranges to the vendors. She has processed applications from each and every one of them, answered their questions and promoted their goods; some of them she has coached through their first-ever craft sales experience; others she has seen grow as artists and entrepreneurs for almost three decades. Everyone is exhausted, and usually exhilarated as well. The orange provides a bit of sweet juicy energy to help make it through to the end. It’s a small gesture that always elicits big smiles. It’s become a tradition, in a relatively short time—just like the Craft Faire itself. The Denman Island Christmas Craft Faire takes place Saturday, Dec 5th, and Sunday, Dec 6th, from 10:00 am to 4:00 pm at the Denman Community Hall and the Seniors’ Hall. Visitors from Vancouver Island are invited to leave their cars at the Buckley Bay Ferry Terminal and walk onto the ferry, thus saving money and avoiding ferry line-ups. From the Denman terminal, it’s a short walk up the hill to the site, or take the Faire’s shuttle service which runs continually from the ferry to the Faire. More than 70 artisans display their wares at the annual Denman Christmas Craft Faire, to be held December 5-6. If you’d like a less crowded shopping experience, come on Sunday, which is consistently less busy. It’s not true that you have to arrive early to get the ‘best stuff,’ says Leslie Dunsmore. The exhibitors have generally been working for six months to build up inventory for the whole holiday season and have plenty of merchandise on hand. In terms of Christmas traditions, 28 years is not very old. Given that historians trace many of our winter holiday customs back several thousand years to pre-Christian times, 28 years is actually just a blip.